In 1925, Fristads’ founder John Magnusson started manufacturing workwear in the village of Fristad just outside Borås, Sweden. 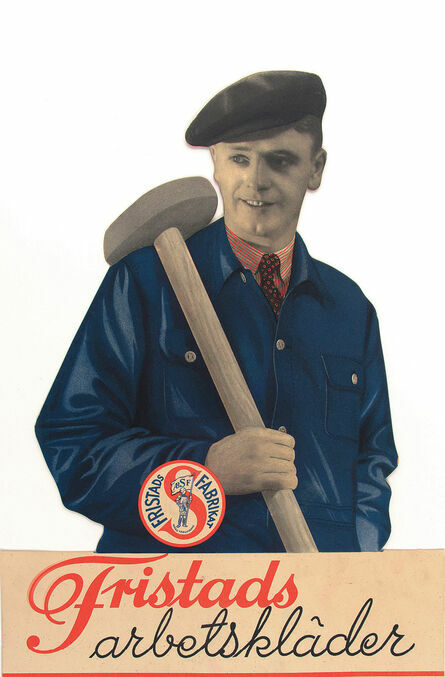 At a time when workwear was unavailable in Sweden but industrialisation was blooming, Magnusson saw the possibility of entering a yet unexploited market. When his attempt to import garments from America foundered, Magnusson came up with the idea of manufacturing workwear himself. By 1929 Magnusson’s company was the first in Sweden to make jeans. He had created an entire range of workwear including bib’n’braces coveralls, blouses and coats worn by dockers, bricklayers, carpenters, painters and other professional craftsmen. By designing in-house and employing skilled seamstresses from local farms, thousands of garments were swiftly made and sold across Sweden. In time, demand outstripped supply, leading to the acquisition of another factory, subsidiaries in other cities and the purchase of Fristads’ own weaving mill. As technological advancements were made in the industry, so too did positive developments in the Fristads’ design. Fristads collections developed over time and by the late 20th century the company was Sweden’s largest workwear manufacturer. Between 2012 and 2017 Fristads and Kansas merged under one brand, Fristads Kansas, uniting immense expertise and experience. Now we are back as Fristads, while Kansas lives on as our brand in Denmark. Today the Fristads Kansas Group operates in more than 20 countries, owns three production facilities, has annual sales of about EUR 450+ million. As market leaders, we set the standard for quality, comfort, development and service.